Do you often run out of cash before the next paycheck hits your account? First of all, you’re not alone. A whopping 78 percent of American workers are living paycheck to paycheck. Second, you have the power to stop living on the edge of financial uncertainty. All you have to do to stop relying on your main paycheck is to have multiple income streams. However, generating a side income is easier said than done for most people. This is why we’re sharing 10 residual income ideas that you can turn into real dollars. The entrepreneurship spirit is alive and well, with 62 percent of American millennials planning to start a business in the near future. Unfortunately, access to adequate startup capital continues to be a major challenge among most aspiring entrepreneurs. The good news is internet technology is making it easier and cheaper to start a business and earn residual income. Platforms such as Shopify and Amazon take the hassle out of building an ecommerce site, so you just need to create your page and start selling your products. To give your online business chance of turning a good profit, sell trending niche products. The best-selling products include handmade items, pet supplies, subscription boxes, organic and natural beauty products, and vitamins and supplements. It can take some time before your e-shop starts making sales, but with some marketing, it’ll get better. Blogging is the residual income idea that refuses to grow old. The number of bloggers in the U.S. has been increasing steadily, rising from 27.4 million in 2014 to over 31.2 million in 2019. If you don’t have a blog yet, it’s time to jump in on the trend. Blogging doesn’t just give you an opportunity to share your thoughts with the world, it also enables you to earn a side income. You can run sponsored posts, sell advertising space, and use it as an affiliate marketing tool. Bear in mind that making money from blogging isn’t a walk in the park. 69.4 percent of all blogs don’t generate any income. The secret lies in having a sizeable readership. To do this, publish quality and engaging content on a regular basis. Still on the writing vibe, crafting an e-book is an ideal way to earn a residual income. We recommend that you pursue this idea after you’ve built an established blog, and here is why. A blog puts your name out there and helps you build a loyal audience. It’s far easier to sell an e-book to an existing readership base, and you can even hype it up on your blog before release. You can also the book on Amazon and other ecommerce platforms. If you have a way with words, but you prefer them spoken, this idea is for you. Podcasts are gaining popularity by the day. Over 73 million people in the States listen to a podcast every month, and 48 million do so weekly. Like blogging, podcasting enables you to monetize your audience. Once your audience grows, you can start running short commercials. The trick to running a successful podcast show is putting out quality content. If you’re really knowledgeable about a certain subject and you can speak clearly and add in some wit and humor, you stand a good chance of being a popular podcast host. Advertisers won’t hesitate to pay top dollar for a few precious seconds on your shows. Do you know the Monster Beverage Corporation was once trading as a penny stock, selling at $0.04 per share? Today, to get a piece of the company, you’ll need to fork out over $50 a share. The gist of this is penny stocks are a good investment for people who’re patient enough to let their money pile up over a lengthy period of time. Or, if you aren’t the patient type, you can sell your penny stocks after they have gained some value. Regular stocks are there for the taking too, especially if you have access to more cash. As long as you can research and identify the most promising stocks, your investment can increase significantly in a couple of years. In 2014, Amazon shares were trading at $300. 5 years later, the share price is over $1,500. If you had invested $3,000 back then, you’d have cashed out over $15,000. No, we’re not saying you start building homes for sale. That’ll cost you a fortune. However, there are a couple of ways to become a real estate investor without spending tons of cash and doing any of the dirty work. We are talking about real estate investment trusts (REITs). These are companies that invest in income-producing real estates, from raw land to vacation homes and urban skyscrapers. With as little as $500, you can invest in a properly-managed REIT. At the end of their accounting cycle (financial year), the company splits profits with its investors. The more money you invest, the higher your dividend yield. Be sure to learn more about real estate investing before putting down your hard-earned money. If REITs sound like a complex real estate investment model, here is a really simple one. If you’re a home/property owner and there’s a free room, why not rent it out? Platforms like Airbnb enable you to rent out your free rooms for a short period of time. You can even rent out the entire home. Guests will book your property and pay you according to your rates. Another option is to offer a room (garage springs to mind) for self-storage services. Given that spending on self-storage space is on the rise and the average monthly cost of renting a unit is $91, your garage can transform from the place old appliances go to die into a steady moneymaker. Ever borrowed some money from a friend or relative and they asked you to pay it back with an interest? That’s how peer-to-peer lending works. As banks and other lenders tighten the noose for unemployed people and those with bad or poor credit scores, peer-to-peer lending platforms are gaining popularity. And now you can make money as a P2P lender! But how does it work? You sign up with a P2P lending platform such as Lending Club and add the amount of money you wish to lend out. You also describe the risk profile of your ideal borrowers. The platform then connects you to borrowers who fit the profile, from where you can approve or reject their credit requests. You make money once the borrowers repay their loans with interest. Do you use it to commute to work and run errands around town? If you answered yes to these questions, you can make money by placing advertisements on your car! How this works is you sign up with companies like Wrapify that pay to advertise on people’s cars. They will place a sticker ad on the sides of your car, and you’ll be required to drive for a certain amount of miles in order to get paid. Think of it as how you can use your car to advertise your business. Sure, you might feel awkward driving around in a branded car, but who cares? You’re literally getting paid to commute in your car. Apps are today’s problem solvers. Think of any problem/task, and there’s an app for that. As you use the various apps on your phone, the developers are probably making money behind the scenes in the form of the banner ads or the in-app purchases. You too can make money off an app. Well, you don’t need coding skills to create your own app. As long as you have a potentially profitable idea for an app, you can hire a freelance developer to build it. Once it’s ready, publish it on the app stores and choose a monetization model that works best for you. If the app becomes popular, you could make a lot of money. 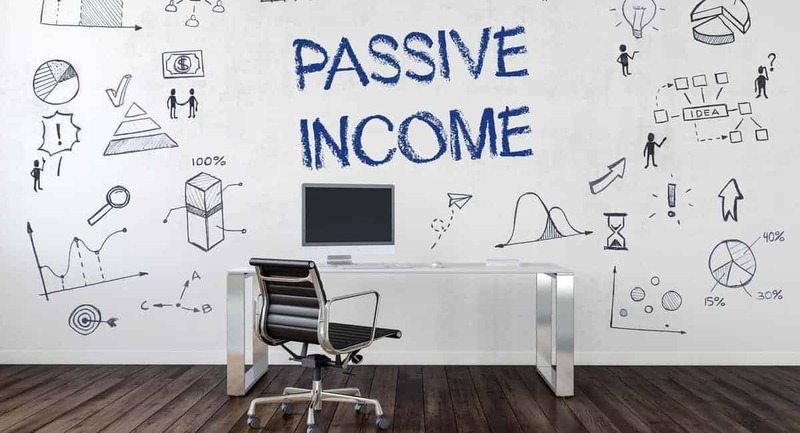 Earning a passive income not only supplements your active income, but it can also be a handy boost in your quest for financial independence. And with the residual income ideas fleshed out in this article, you’re in a better position to start earning. Bear in mind not all ideas will work for you and capital requirements vary. After choosing an idea, we encourage you to do further research and establish whether it’s a good fit before going all in. Good luck and feel free to explore our site for more investing insights.